Polar bears are pretty strong swimmers—probably the strongest of all the land-based predators. They will spend much of their time in swimming and thus they are sometimes referred to as marine mammals. Polar bears are capable to swim many a miles without stopping. However, they will less likely to swim in open waters because bears need ice floes to stop and relax. 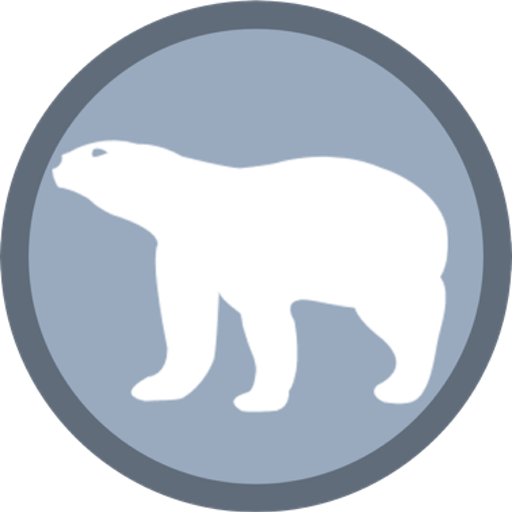 Let’s see now how far can a polar bear swim without stopping. Polar bears will cover great distances in swimming and thanks to their large webbed feet that aid them in swimming. They are thought to travel across bays with no hesitation whatsoever. During summer, many polar bears swim from one ice floe to the other searching for a seal. Sometimes they do swim in open water for without any specific purpose. Polar bear scientists claim that in summer subadult bears are more likely to enjoy swimming as compared to the adult bears. That is not to say that mature bears are less skillful. It’s just that young bears haven’t probably had enough of swimming and so they enjoy every bit of it. At times, polar bears swim in open water 60 to 70 miles offshore in Barents Sea, Greenland, and Labrador. Scientists attached radio collars to the bear so they could measure the distance covered by a polar bear in swimming. 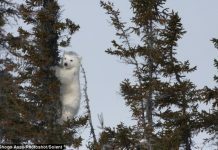 Many a times, they have seen polar bears traveling several kilometers most probably while stopping on ice floes. 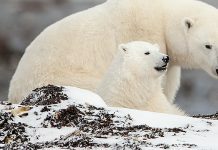 Nonetheless, scientists do believe that polar bears are not really used to marathon swimming and their presence in open water is more of accidental than normal routine. During spring and summer, the ice floes move to the south thereby forcing bears to travel along with them. As it turns out, many polar bears tend to follow ice floes and by doing so they often find themselves swimming in open water. Polar bears swimming in the northern coastline of Iceland often get drowned. 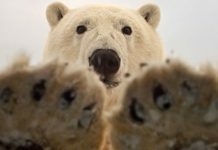 The polar bear’s health defines as to how far it can swim in open water. Healthy polar bears are likely to travel great distances for they are well insulated by a layer of fat which keeps them warm in cold water. 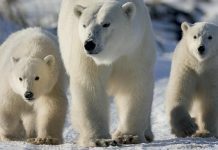 Female polar bears do not fancy their chances swimming long distances especially when their cubs are with them. Young polar bears aging less than a year are pretty much vulnerable to hypothermia if they swim for several miles. That is why mother bears usually carries them on her back (but only when the cub is small). What’s the Longest Swimming Distance Covered by any Polar Bear? The longest distance covered by any polar bear in swimming is about 427 miles—held by a female polar bear. She swam for up to 9 days continuously through the Beaufort Sea and covered as much as 427 miles (687 km). After resting on a sea ice she resumed her journey to travel another 1,800 kilometers but this time she covered some distance on foot too. In the Beaufort Sea, the Arctic Ocean sea ice is beginning to disappear. It’s going further north each passing year—away from the polar bear’s reach. Now polar bears must compromise their prime feeding areas in order to follow the ice. 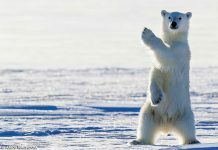 Scientists believe that polar bears inhabiting the Beaufort Sea had to swim only 10 to 15 miles earlier to find sea ice. However, now they may have to swim as far as 60 miles in search of the ice. Polar bears inhabiting Hudson Bay do not often swim long distances. The Hudson Bay population isn’t a major concern for scientists. 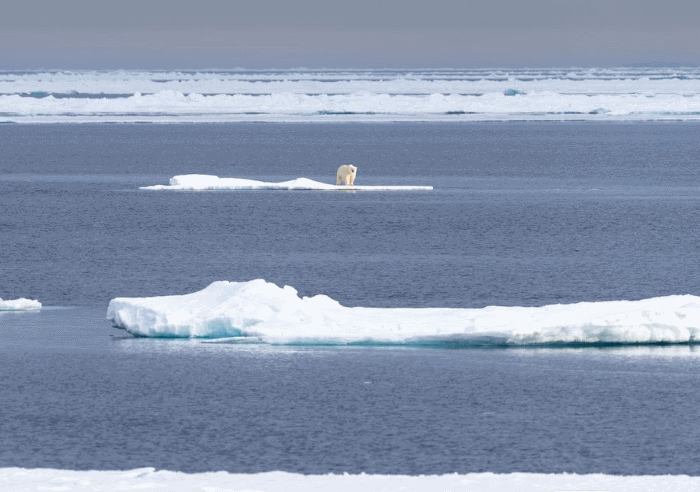 Scientists are particularly worried about bears living in the Beaufort Sea. 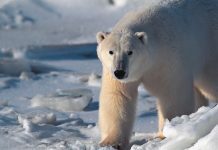 According to Canadian researchers, the polar bears found in the Beaufort Sea likely swims at least 50 kilometers which is even greater than our marathon (42.2 km). They are thought to swim 92 to 100 kilometers in approximately 4 days.